This property is only two blocks from the San Diego Convention Center, Ralphs Grocery Store, Historic Gaslamp and Horton Plaza. There are three units in this property. 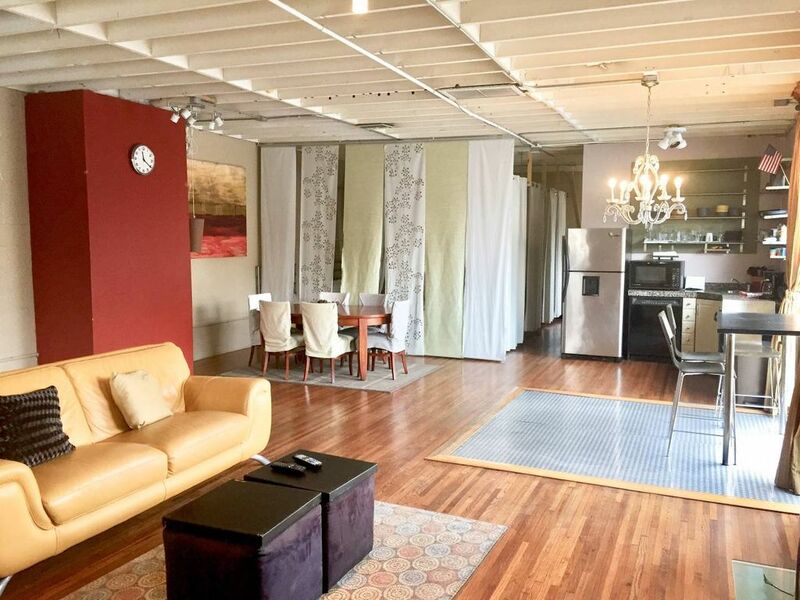 This loft suite is 1228 square feet of the best amenities available while being located seconds walk from the worlds famous Gaslamp Quarter, moments walk to the San Diego Convention Center, the Ralphs Grocery Store or Horton Plaza Shopping Center. The loft has an open N.Y. Loft feel with hardwood floors; diamond plate accents one queen bed, two twin beds and one lounge sleeper. A few of the amenities includes linens in the unit, forced heating and air conditioning, 42” Plasma TV, and free wireless internet. We encourage you to “Go Green” and bike Sea Port Village, The Famous San Diego Zoo, Balboa Park, The San Diego Bay, or the USS Midway. If your stay includes Sunday feel free to enjoy the local farmers markets. For our Jewish clients we are next to Chabad of Downtown and Rabbi Zalman Carlebach will provide you with your kosher needs for your stay. Parking for one car is available on-site at an additional cost. Additional parking can be made available upon approval. Perfect accommodations that met our needs. Lots of open space, open floor plan and close to all that matters. Great value. The property itself was clean and met our expectations. However, communicating with the owners was terrible. We rented both units in this building for a party of 8. We had major issues with the downstairs unit (bed bugs), and found the owners did not answer phone calls, and will not provide a refund. Be wary of staying at either unit due to poor management. We are sorry you had a hard time with communication. Our property manager was out of town during your travels. With regards to your big concern. We take extreme measures to make sure we don’t harbor any insects including bed bugs and all our mattresses are protected and checked regularly. There was no sign before or after the guest that stayed there informed us. We have a professional company treat all our units on a regular basis. This place is super cute and we loved the location. There were a couple of problems along the way though, which made it a bit frustrating. The internet rarely worked, and when it did it was glacially slow. To be fair they did send someone to try and fix it, but unfortunately it was still not working when we left. The other problem was that it hadn't been very thoroughly cleaned. Most of the plates were coated in dust, and there were no supplies to do it ourselves. No broom, no vacuum, no mop. Other than that though it's a very well laid out space, and the owners are responsive. It really is an amazing location right in the gaslamp district and for people who aren't planning on eating/being in the place during meals it would be perfectly fine. Samantha thanks for the advice and bringing up the issues. We have a new great cleaning service and provide towels and shampoo and soap. The kitchen utensils have been upgraded and the internet is up and running well. Overall impressions place needs fixings and some renovations. We spent over an hour trying to locate the property address. No numbers on the gate, door or anywhere. The loft advertises 2 bedrooms there is no divided rooms, no walls only curtains if you want privacy in a small group or with family this is not the place. Key code was different then indicated on the iteneniary. Sink faucet handle was broken. The shower was impossible to put on for the average person. The handle on the shower was not easy to use. The location was great walking distance to restaurants, bars, stadiums. Place should be advertised as a loft with no walls sleeps 4 people. Not a 2 bedroom loft. No Walls seperating bathroom, bedrooms, the toliet is private. We provide bikes for your use around the area. Go Green! Take a short bike ride to the water taxi behind the convention center or ride to pier and take the ferry to Coronado to enjoy the best beaches, most picturesque restaurants, and upscale living in SD. Rates are subject to change without notice. Parking is free Monday thru Thursday. However, there is a $20.00 per night per car Friday thru Sunday. Contact or inquire for special rates and discounts.